Kakteen Sukk. 50(8): 202, 201 (1999). Altitude range: 1900-2100 metres above sea level. Type Locality: Department of Santa Cruz, province of Valle Grande, a few kilometers north of the settlement of Vallegrande, 2050-2100m, Bolivia. Habitat: Andean Chaco. Thermotropical semiarid. Sulcorebutia langeri grovs on a sandstone hill of white appearance from distance in a dry forest area of Neocardenasia herzogiana and Schinopsis haenkeana. The secies is strictly endemic and insufficiently known in habitat. 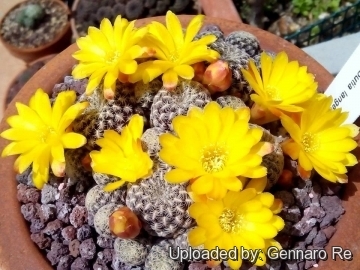 Description: Sulcorebutia langeri is a form of Rebutia cardenasiana, but not sufficiently differentiated and considered merely a local variant of the latter (if not the same). 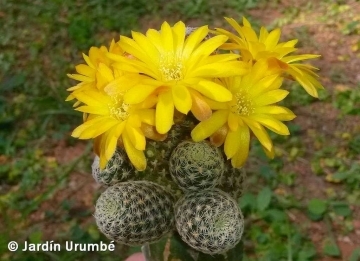 It has pectinate white spines covering the black-green stems and produces sunny yellow flowers (in profusion in spring) larger than the tiny bodies. S. langeri is one of the easier to recognize yellow-flowering Sulco, well-known bot not yet very common species in cultivation. Derivation of specific name: It was discovered near Vallegrande by Bro. Andrew Langer of Pampa Grande. Spines: 21-25, up to 3 mm long mostly white, occasionally white and brown. The spines are adpressed, pectinate and finely hairy if seen through a lens. Fruits: Brown with pink scales. 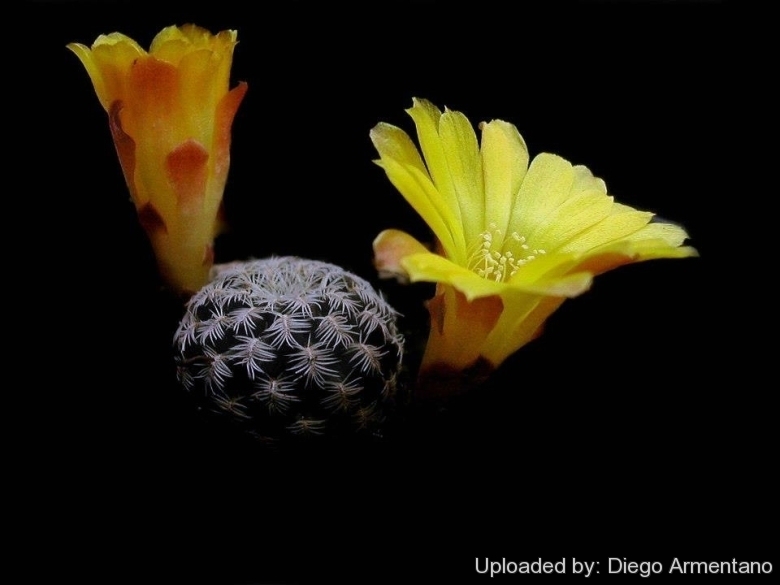 Rebutia cardenasiana (R.Vásquez) G.Navarro: has tiny globular stems with short pectinate white, yellowish or brownish spines. Flowers are yellow. Distribution: Cochabamba, Bolivia. 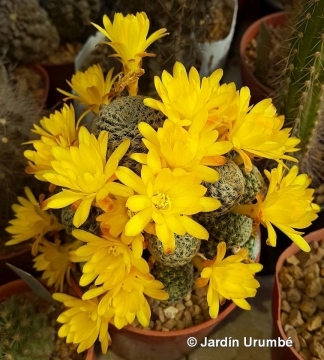 Sulcorebutia langeri K.Augustin & Hentzschel: has pectinate white spines covering the black-green stems and produces sunny yellow flowers. North of Vallegrande, Santa Cruz, Bolivia. Cultivation and Propagation: This species loves a very permeable, coarse mineral soil as well as to be strictly kept dry throughout the winter quiescent period since it is very sensitive to any moisture excesses, To prevent rottenness it is also advisable to surround its root neck by very rough sand or grit, this help a fast water drainage and an appropriate air circulation. Plants are quite frost hardy -5 (-10)° C.